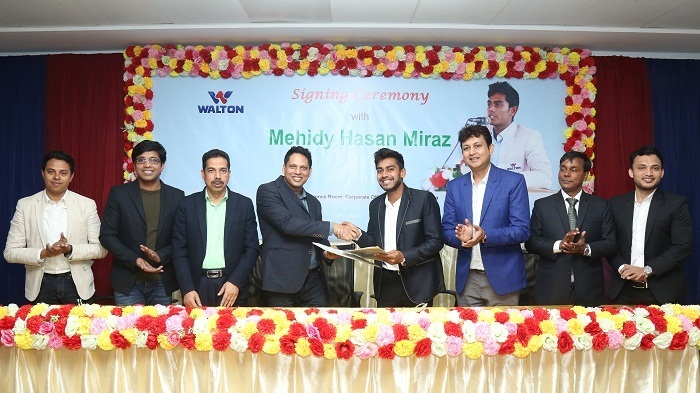 Bangladesh national cricket team player Mehidy Hasan Miraz has been appointed as the ‘Sports Ambassador’ of Walton Group, the country’s leading electronics, electrical, IOT and home appliances manufacturing company, for next two years. Earlier, the allrounder was appointed as ‘Youth Ambassador’ of Walton for two years in 2015. An agreement between Miraz and Walton has been signed in this regard. The signing ceremony was held at the Conference Room of Walton Corporate Office in city’s Bashundhara Residential Area on Saturday (12 January 2019). SM Mahbubul Alam, Director of Walton Group, has inked the deal with Miraz. The agreement signing ceremony was attended, among others, by Walton Group’s Executive Director SM Zahid Hasan, Deputy Executive Director Uday Hakim, Operative Director Firoj Alam, Head of Brand Development film actor Amin Khan, First Senior Deputy Director Milton Ahmed, Managing Director of Power Play Communication Niamur Rahman Palash. Welcoming cricketer Miraz with a flower bouquet, SM Mahbubul Alam said, cricket is branding Bangladesh around the world in which cricketers like Mehidy Hasan Miraz leading from the front. He is a very talented cricketer and a top allrounder of Bangladesh national team. On the other hand, Walton is the top brand of technological products in Bangladesh. We are going to obtain the global market very soon. Terming Miraz as a star of Bangladesh cricket, he said Walton is also a star in country’s technology-based electronic products. These two stars have joined together. We welcome Miraz as a new member of Walton family. We want him to be in the top place in all fields. Uday Hakim, Deputy Executive Director of Walton, said, we feel proud to have Miraz as our Sports Ambassador. He is also very happy to join us. We hope that the talented allrounder will lead our national team as captain very soon. Bangladesh will become the top team in all formats of cricket. We will win World Cup under his leadership. Walton is also going to become one of the top brands in global market. I wish a successful journey of this pair. Speaking on the occasion, Mehidy Hasan Miraz said, Walton is a very familiar name in country’s cricket arena. They are not only sponsoring in all kinds of games, but also patronizing players. They made me Youth Ambassador when I had less popularity. They have appointed me as Sports Ambassador today. This is really a great honor for me. I consider myself as a member of Walton family. I will try my best to represent Walton positively in home and abroad and brighten the brand image of the company.